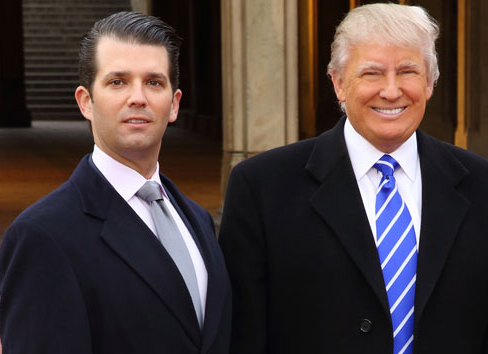 Donald J. Trump, Jr. (left), with his father, Donald Trump (right). Super Tuesday is upon us and Texans go to the polls to nominate a presidential candidate to represent their parties in the Fall elections. Donald Trump, Marco Rubio, and Ted Cruz are front-runners on the Republican ballot, while Hilary Clinton and Bernie Sanders are vying for Texas delegates on the Democratic ticket. We spoke with Donald J. Trump, Jr. – that’s the candidate’s son – on the eve of the election. We spoke about the future of the Republican Party, his father’s temperament, and whether or not Don, Jr., would run the family business if his father became president. Excerpts will be heard during our election coverage on Super Tuesday, while the full interview is online here. This entry was posted in KRTS News and tagged Donald Trump, Republican Party. Bookmark the permalink.